Picking the best resort for your honeymoon is no easy choice; after all, you want it to be a place so incredible you’ll both be talking about it for the rest of your lives. Well, luckily enough, the Maldives is one of the world’s top honeymoon destination and is packed with resorts that simply exude romance and excitement. Obviously the main appeal is the romantic villas surrounded by powdery white sand and turquoise lagoons, but some of the less well-known attractions of having a honeymoon in the Maldives is the unsurpassable level of privacy you have here. With the exception of one new combined development underway in South Male’ Atoll, every single resort in the Maldives is located on an island of its own. Think about it…just one, idyllic private paradise, completely cut off from the rest of the world, but filled with all the amenities and luxury services you could dream of…No wonder so many honeymoons (and celebrities in search of privacy from the paparazzi) are such big fans of the Maldives! Standards are very high at all of these islands, but some stand out from the rest as the best resorts for honeymoons in the Maldives. 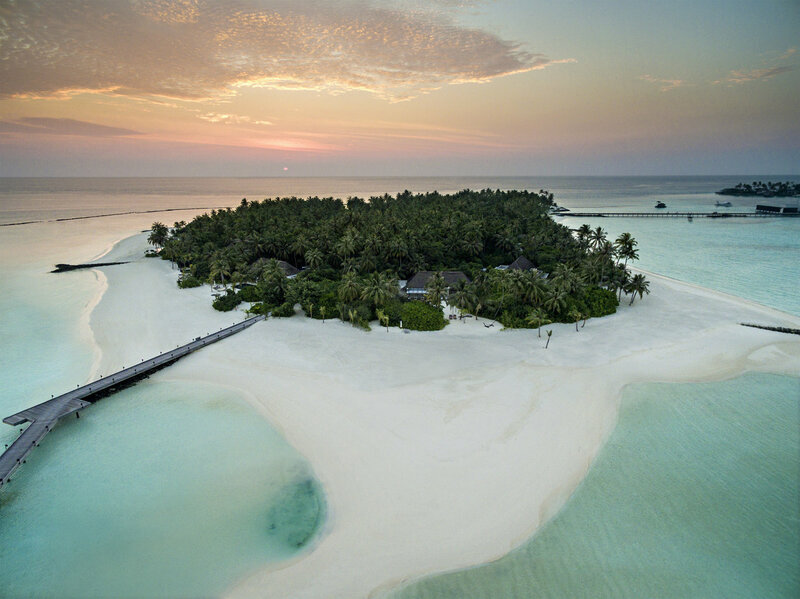 Our team of experts is on hand to give you personalised advice about which one is best for you, but in the meantime, we’ve compiled an Ultimate Maldives Honeymoon Guide to showcase some of the best honeymoon resorts in the Maldives, and to give you the lowdown on why they’re such good choices. Let’s start with a resort with unquestionable wow-factor. Park Hyatt Hadhaa will blow your mind right from the second you lay eyes on it. People who have an eye for architecture and design will be particularly impressed. Let’s start with the scale of the buildings – these vast, contemporary but tropically-inspired restaurants and guest areas won’t fail to impress, and they centre around a huge swimming pool which is incredibly Instagrammable. The overall design conveys a sense of style and grace that’s hard to equal. This includes the chic minimalist villas, made from sustainable resources and decked out with sumptuous beds and large bathrooms. The island itself has been preserved with the utmost care and the reef surrounding it is untouched by development, leaving it healthy and vibrant. Just metres from the villas, you can dive into deep, pristine waters filled with turtles, parrot fish and napoleon wrasse. 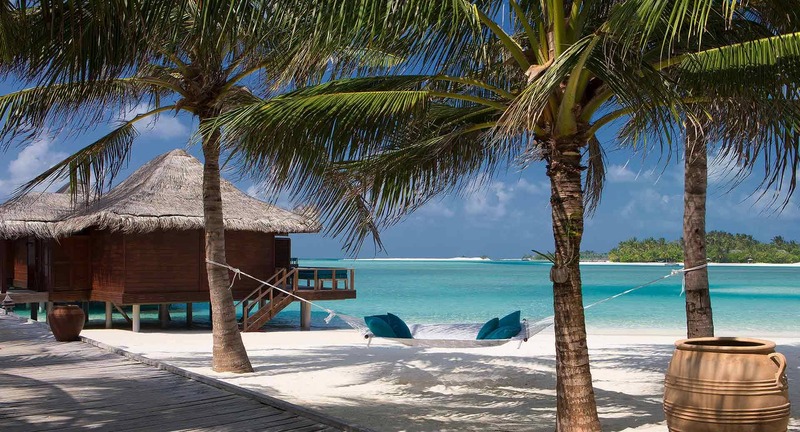 The resort is also located in a far-flung atoll so you won’t be disturbed by service boats, planes flying overhead, ferries and the like – a perfectly private paradise! If you prefer to be closer to the international airport but still want a sense of seclusion, the cute little island of Anantar Veli is a great option (and also more affordable than the aforementioned resort). This island was specifically set aside for adults only, resulting in a tranquil atmosphere and staff who specialise in perfecting or crafting any additional facets of your honeymoon, such as private dinners for two or other special services. There’s even a ‘kissing chair’ and ‘love wall’ in the tropical gardens where you can hang a heart with your names on it. This dreamy couples island is conveniently located adjacent to its larger sister resort, Ananta Dhigu, so guests are allowed to share the facilities including the restaurants there too. 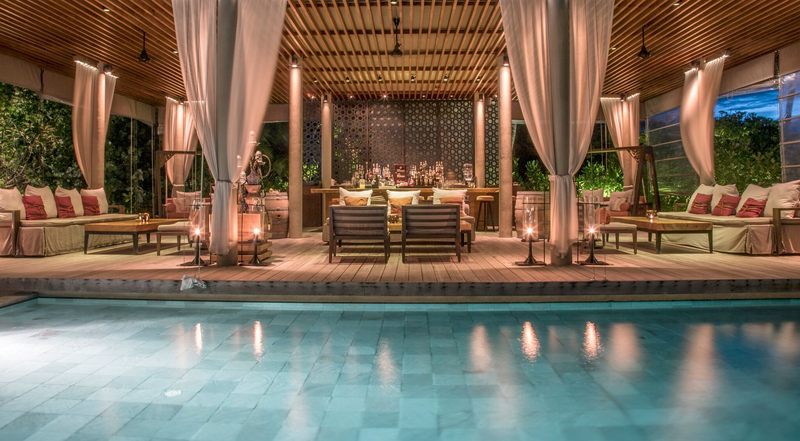 This resort is part of the same company but is a newer and more glamorous addition. It’s located in one of the most stunning atolls, Baa Atoll, which is home to the UNESCO World Biosphere Reserve of Hanifaru Bay. So if you’re looking for experiences to make your honeymoon even more memorable, look into this one! Here, you could both have the exhilarating experience of swimming with whale sharks and manta rays during an incredible natural plankton phenomenon which occurs during late July to early October. Even if that’s not your cup of tea, you’re sure to be impressed by the beautiful water villas with private pools and lagoon views from the bathtubs (big enough for two). You can also book a romantic dinner in the amazing underwater restaurant, where you can watch marine life glide by as you dine on delicious cuisine. Or there are all kinds of other excursions and distractions including a romantic dolphin-spotting cruise. This high-end resort is guaranteed to delight honeymooners with its beautiful villas, excellent cuisine and great service. Undoubtedly one of the resorts with the most ‘Ooh la la’, Randehli is the second hotel opened by Luis Vuitton Hotel Management group. It was designed by architect Jean-Michel Gathy and as you might expect from a team like this, features jaw-dropping architecture and décor. You won’t even need to get out of bed to open the curtains as the digitalised system takes care of it for you. 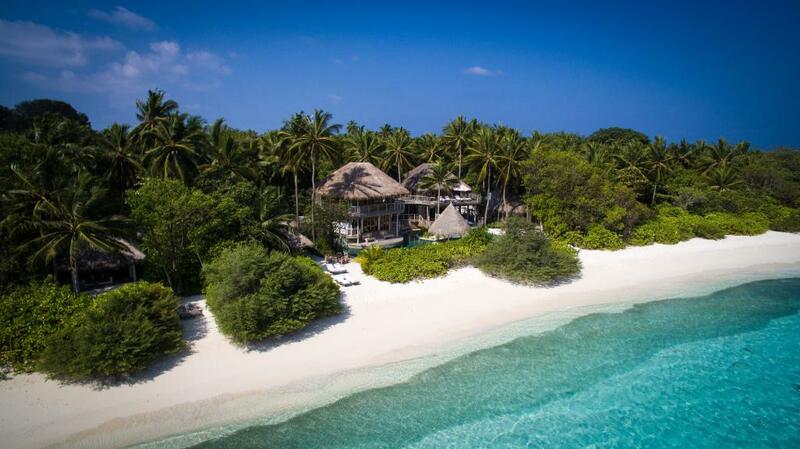 There are just 45 villas, making it one of the lowest guest population densities in the Maldives, which only adds to the attentive service and sense of seclusion. Each beautiful villa has its own private pool and there’s a Guerlain spa so you can ensure you’re both feeling and looking your most radiant and relaxed. Randehli prides itself on exceptional service, and fuses elements of its French heritage with its tropical island home, including the staff greeting you with a ‘bonjour’. The incredible champagne room is another hallmark of its quality as well as its French roots. If you like high-tech luxury and impeccable style, this is the resort for you and your partner. People always speak in hushed tones about the Four Seasons experience, and when you encounter it you’ll understand why…Prepare to be treated like royalty from the second you arrive – not in a pompous way, but in a relaxed and friendly way whilst retaining a level of respect and conveying a genuine desire to see your expectations surpassed. It makes you feel relaxed, cared for and looked after in a way that many other five star resorts still can’t match. That’s just one of the reasons Four Seasons Landaa Giraavaru is the perfect place for honeymooners; the staff will ensure that you’re completely content with absolutely everything, and even think of little personalised ways they can make it even better. In addition – the island! This is one of the most magical islands in the Maldives, with beautifully cared for exotic gardens, soaring coconut trees and a breath-taking beach. The villas are also carefully designed to maximise your sense of privacy and feature spacious private outdoor areas. Another highlight is the romantic ‘night spa’, which is a small spa area set up under the stars, alongside the ocean. Here you can enjoy a massage alongside your loved one in the cool of the night. The staff are willing to help you design additional experiences too, to ensure your honeymoon is unforgettable. 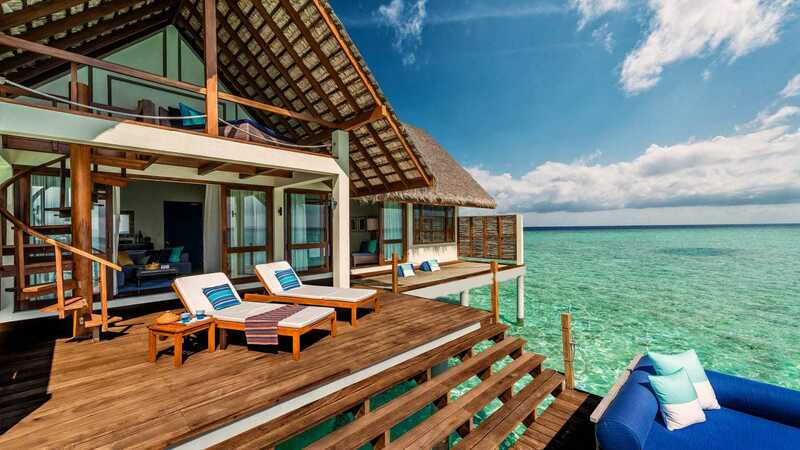 Honeymooners in search of a more affordable Maldives holiday without compromising on luxury would do well to look to one of the newer resort openings, such as Cocoon Maldives. This cute island, fusing Italian design with the beauty of the Maldives, is a perfect honeymoon option. 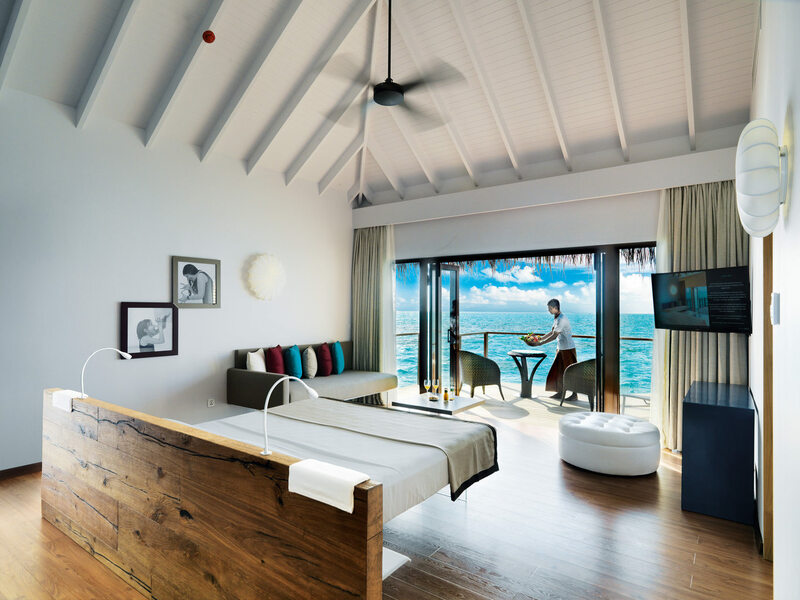 As the name suggests, Cocoon Maldives offers a high level of privacy and comfort, but also offers opportunities for you to mingle with other resort guests if you feel inclined to. The attractive villas are an enticing space to relax in and there are romantic features scattered around the resort too, such as swings on the beach. If you’re looking for a good price as well as a beautiful island with modern facilities, plus options to mingle with fellow guests, then check out Cocoon Maldives. For some reason this luxury resort seems to go under the radar in the Maldives, even though it’s one of the prettiest. It’s one of the high-end options but is understated, and extremely stylish – definitely with enough pizazz to impress any honeymooners. The beautifully-decorated villas capture perfectly the essence of a tropical island, combined with contemporary facilities and artistic flourishes. Every single item chosen to decorate the rooms has been carefully considered. The natural beauty of the island is also something worth noting – sure, there are very few islands in the Maldives that could ‘offend the eye’ but some are even more stunning than others. Moofushi is one of them. The soft white sand beach is gorgeous and the pale turquoise colour of the lagoon could not fail to invoke a reaction…we’re getting nostalgic just thinking about it! This is an under-rated rustic-luxe paradise at its best. 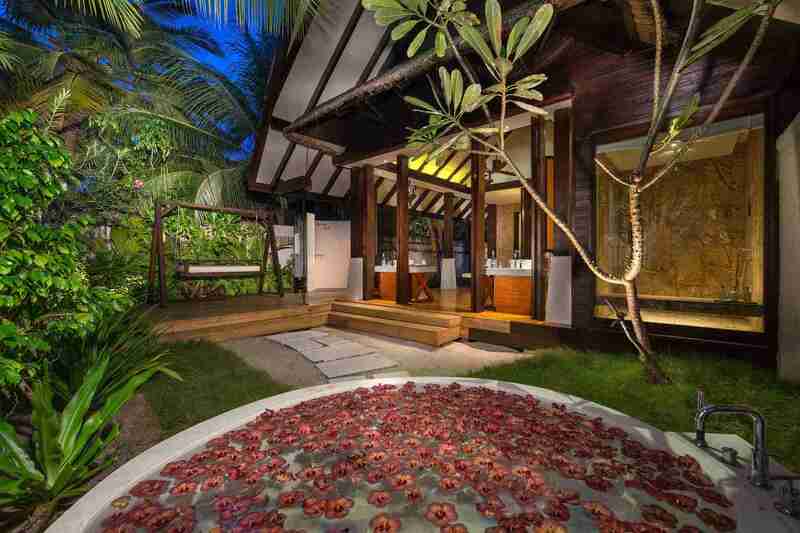 This is another perfect example of a Maldives honeymoon resort that has the x-factor. Expect luxury and tropical design on a grand scale (for the Maldives!). Sure, every island is tiny but this is one of the larger ones, so you’ll see decadent scenes of swimming pools, poolside bars with hookah pipes, and water villas snaking out into the ocean. The villas are particularly luxurious, with enormous beds and stunning marble bathrooms filled with luxury bathroom goodies. A highlight of the beach villas is the L-shaped private swimming pool that curves around two sides of the building. It adds some additional glamour to an already opulent villas. Another highlight is the sala in the private gardens; this sumptuous day bed is essentially an al fresco four poster bed to lounge upon like a prince or princess while you soak up the beauty of the island. Whether you choose a land villa or a water villa, you won’t be disappointed because everything has been designed with luxury in mind. You’re bound to feel like a VIP with the excellent service too. 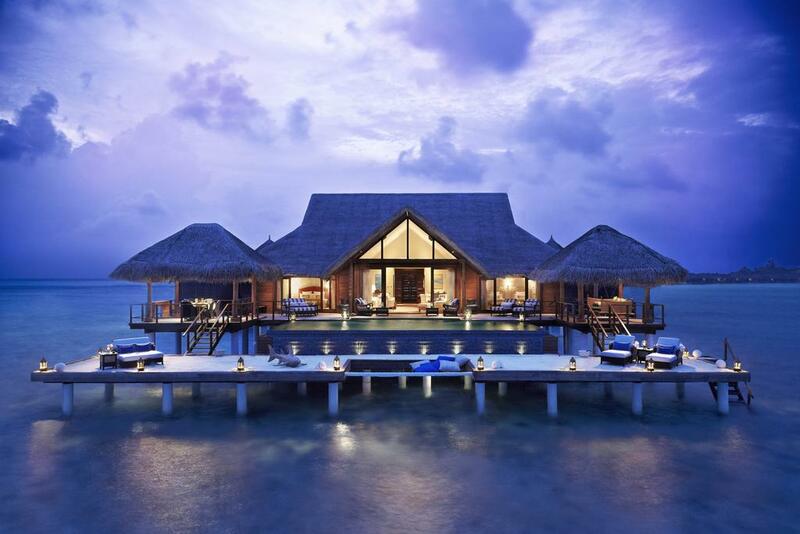 This is one of the resorts in the Maldives that sets the standards for luxury and innovation. 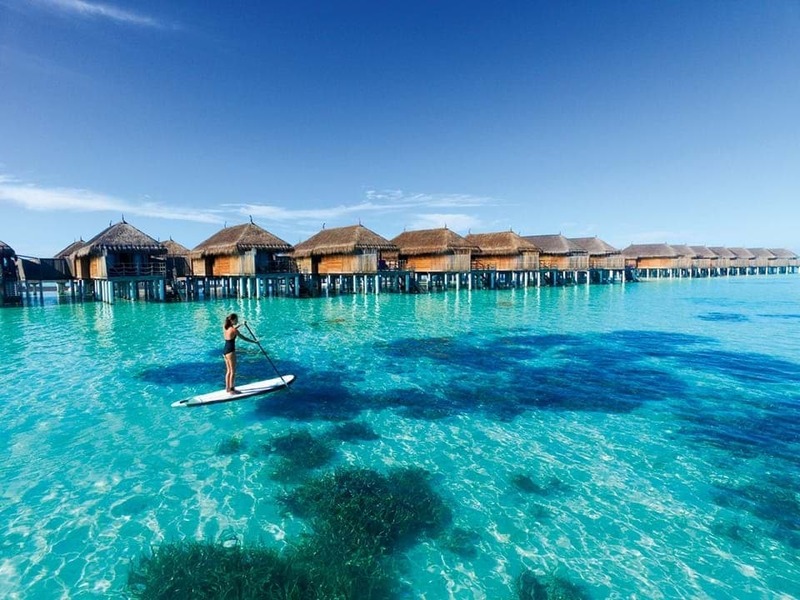 Although there are no water villas at this stunning resort (check out its sister island, Soneva Jani, for a luxury water world experience), you don’t feel as though you’re missing out on anything by only having land villas here. That’s because the land villas are so exquisitely designed and spacious that they have everything you could have ever dreamed of and more. With special features like a waterfall and stepping stones across a pond in the bathrooms, and vintage explorer-style features in the bedrooms, these villas conjure up a truly unique atmosphere, evoking a spirit of travel, elegance and adventure. There’s also a variety of breath-taking restaurants including a treetop Tarzan-style venue, and an observatory so you can stargaze with your loved one. The other stellar facilities include an impressive marine biology centre (if you want to learn more about the local environment), an underground wine cellar which can be booked for private meals and a heavenly chocolate room. The cuisine is also amongst the best you’ll find in the Maldives. In addition, the spa is world-class and is the perfect spot to enjoy a couples massage, side by side with your other half. 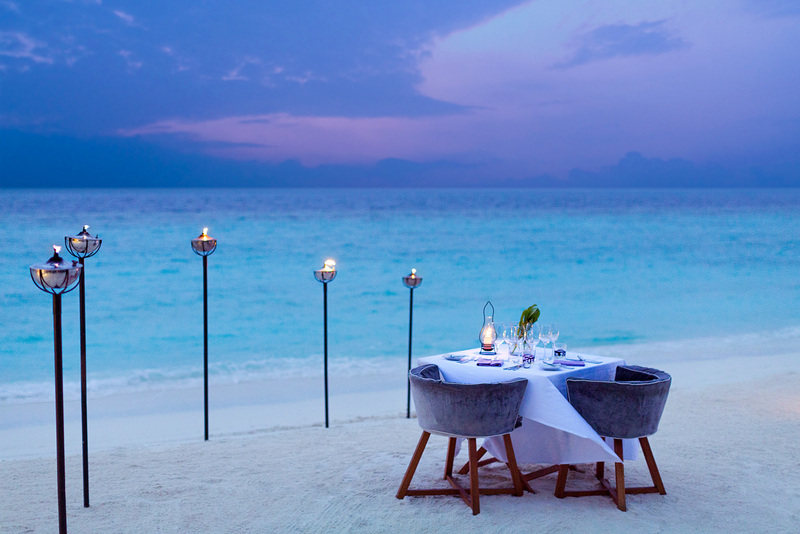 Taj Exotica has been a favourite of honeymooners for years for a number of reasons. One of the main attractions is that it’s a tiny, intimate island – so small you can even see from one side to the other at its narrowest point. This means it has a unique character, and it has been beautifully landscaped with flowering plants. Another big attraction is the lagoon that surround it. It’s the largest lagoon in the Maldives and the iridescent pale azure waters stretch away seemingly endlessly. As we mentioned earlier, all of the water in the Maldives is pretty, but some is even more amazing than others, and this is one of those examples! The food is also excellent, and if you want to impress your partner then there are some opulent options, including the ‘$200 pizza’’ which features gold leaf, caviar and wagyu beef. Another highlight is the specially-designed dining platform which is located in the lagoon. It’s barely larger than a double bed in size, and was designed for an intimate meal for two, surrounded by the gentle whisper of the lagoon.